This home has gone through a complete transformation. Wonderful water views from various rooms throughout the home. Thoughtful floor plan makes for easy living. Light and bright living room welcomes you to the home. Main floor master suite boasts double closets with window seat. Master bathroom with walk in shower, classic white tile, heated floors for chilly mornings. 12 Bath off Living Room. Kitchen with white cabinetry, quartz counter tops and new stainless appliances. Dining room off kitchen with access to newly poured back patio. Upstairs boasts 2 bedrooms, full bath with original claw foot tub, and laundry closet. Eco Friendly Distressed Bamboo Floors throughout. Plan to entertain family and friends on the spacious patio off kitchen and dining room. Detached former garage perfect for studio or workshop and provides an abundance of storage for your toys. Off street parking. Close proximity to the Gaslight District ~ enjoy restaurants, shopping and church bells!! To the studs renovation ~ spray foam insulation,new Marvin windows, new doors, new natural gas forced air furnace, new gas water heater, heated floors in full baths. Details typical of older homes ~ 8" baseboards, transom windows, solid wood 5~panel doors. 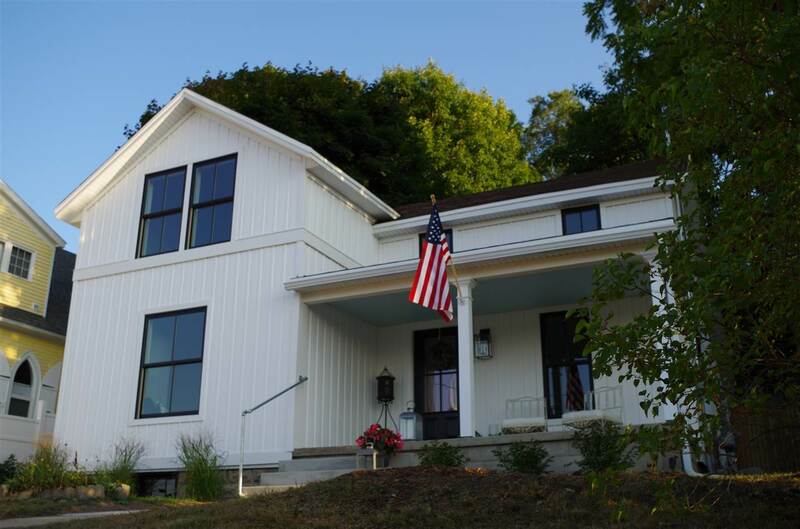 Move in and immediately enjoy the ease of living in Downtown Petoskey!!! !